Nine years ago, Tipperary woman Ailbhe Gerrard was working on Dublin building sites as a project manager. 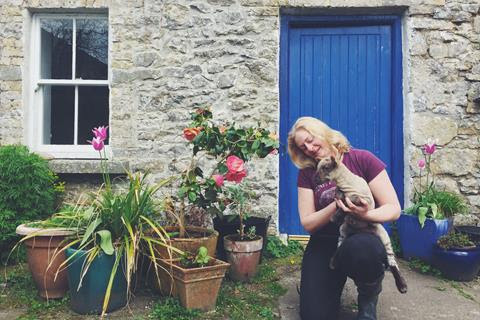 Little did she know that she would soon be far from the concrete and cranes of Dublin and instead running her own farm in her native county - where she would become an expert on bees and organic farming. Gerrard founded Brookfield Farm, which is based on the shores of Lough Derg and specialises in artisan food, about six years ago. "Brookfield Farm is a farm I bought myself with all my own money," said Gerrard. "Before the economic crash, I had been working in Dublin in construction, as a project manager. After the crash, I studied sustainable development in London. While studying that, I thought about what my next big project could be and decided it would be food and farming." Gerrard is from Nenagh originally, about half-a-mile from Brookfield Farm. "I really believe in farming and agriculture," she says. "Before I set up the farm, I could see the potential for a medium-sized farm that could be economically viable and also provide a place for wildlife to thrive. The old traditional farms did that; they didn't impact negatively on biodiversity and wildlife. I'm carefully designing the farm to be sustainable environmentally, socially and also economically, so that I can make a living from it." Since December 2014, people have been able to buy shares in the farm's beehives, a product known as hiveshare. "I was trying to think of a way that people could have some ownership of the farm -and that's where the hiveshare idea comes from." The shares that can be bought range from one-eighth of a hive to a full hive. A full share of a hive in the farm, which is called the 'Queen Bee' hiveshare, costs €430. A quarter share, called the 'Bee Meadow', costs €260. An eighth of a hive, which is called the 'Bee Garden', costs €95. Each hiveshare comes with its own gift box, certificate, and jars of raw honey - straight from their hive. There is a big demand for the hiveshare product. In the first year that the product was launched, 75 people bought a share of a hive. "Now I have 120 customers and that's the maximum I could take," says Gerrard. 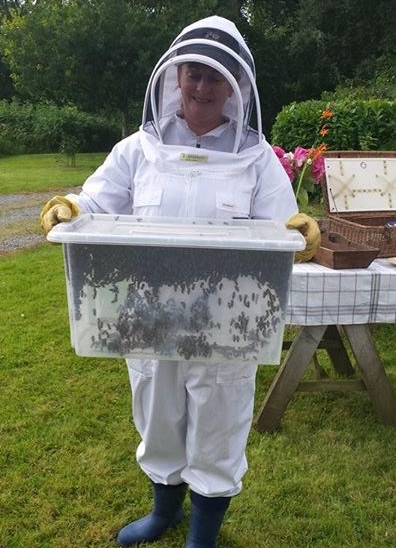 Each year, the customers with hiveshares are invited to a honey celebration on Brookfield Farm, where all the refreshments are themed around honey. "There are farm walks, treasure hunts for children and a barbecue in the evening," says Gerrard. "People also get their share of the honey here. I lose money on the honey celebration but it's important to build relationships with the people who buy hives and this event helps to really connect with them." One of the main attractions of the hiveshare is the jars of the farm's raw honey that come with each share, as raw honey has advantages over the blended honeys bought in shops, according to Gerrard. "A shop-bought honey is typically a blend of honeys from a lot of different countries," says Gerrard. "My honeys are not blended and they are much fresher. It isn't heated above 40 degrees, so all the natural health-giving enzymes and pollens are present in the honey. This is unlike imported honey, which has to be pasteurised, so a lot of its goodness is lost. "Irish people are big honey eaters but a lot of the honey bought in shops here is imported." It is hard to produce raw honey in Ireland and this is largely down to the weather, according to Gerrard. "Summer 2016 was so dull and damp that there was almost no honey." To help in the farm's production of raw honey, she has about 12 acres of bee-friendly plants and plants on her farm, including red poppies, crimson clover, phacelia, cornflower and linseed. She cites John's Delight as one wildflower mix which she particularly likes. "This mix flowers from May and June right through to November, giving a range of forage for bees and other pollinators." The farm plans to produce its own ivy honey. "Ivy honey is a very particular Irish honey. It wasn't sold for years because people thought it was too bitter, but ivy honey has similar qualities to New Zealand's Manuca honey." 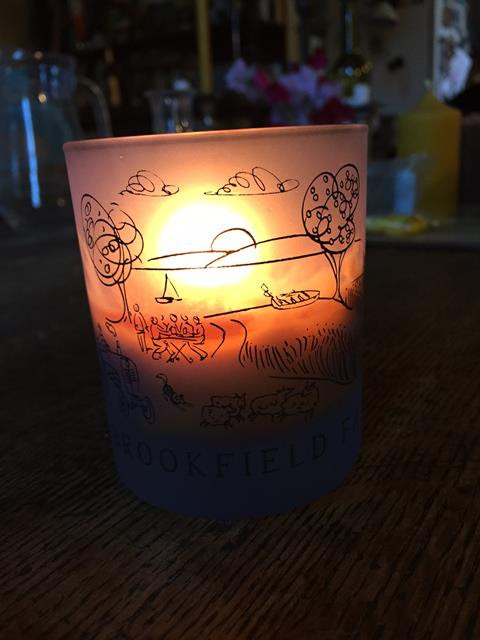 Brookfield Farm also sells various gifts, such as beeswax candles and beeswax lip balm. "People love the beeswax candles for burning at dinners as they don't want to burn paraffin candles around food," says Gerrard. 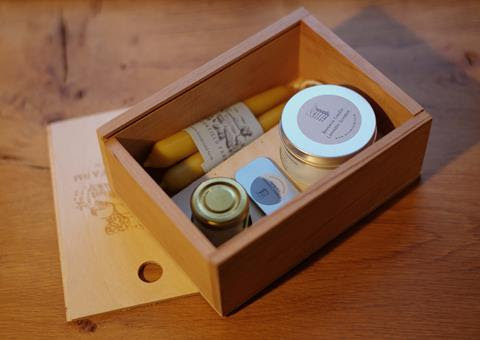 The farm's candles and lip balm, as well as its jars of raw honey, are also sold in gift boxes. Its various candles and gifts are sold in a number of shops, including So Collective in Kildare Village, Cow's Lane Designer Studios in Dublin's Temple Bar, the Irish Design Shop in Dublin, duty-free shops in Shannon Airport and in shops in Wicklow's Kilruddery Estate. They are also sold online (at www.brookfield.farm) and at fairs and shows. Lamb is the other big product sold by Brookfield Farm. The farm's lambs have their own distinctive flavour because they eat the flowers and foliage around the shores of Lough Derg, such as wild mint, wild thyme, wild strawberries, and honeysuckle, according to Gerrard. "The lamb is delivered straight to the customer from the butcher as a half or a whole lamb, generally cut to the customer's specifications. It's really popular. I have to increase my lamb numbers next year to meet demand." She employs up to 12 people on her farm at any time. "I hire people for different projects," says Gerrard. "The employment is seasonal and project-based. "The area that I am living in is very economically deprived. Part of the ethos of this farm is to bring life back to areas hit hard by the recession." One of the projects the farm is involved in recently grabbed the attention of Britain's Prince Charles. The project involves the meticulous repair of an old dry-stone wall surrounding a wood at the top of a hill overlooking Lough Derg. The farm received a grant from the Heritage Council to cover some of the cost of this project. "The project is keeping the traditional skills alive and also training others. It has proved to be quite an interest for neighbours too, who drop by to see the work and progress. "It was because of this project that I was invited to meet Prince Charles on his recent visit to Kilkenny in May. He was very interested in the project. "My parents had a farm in this area originally but they had to sell it. My dad had cattle and horses. A country upbringing is great for children as you learn skills and self-reliance. "In farming, you get your share of losses and it's great to know that you can get through those." Although having a farm on the shares of a lake sounds ideal, it can be challenging. "Distances and getting around can be a challenge," she admits. "Because the lake is so long, it's virtually a coastline." She clearly wouldn't trade her farm for anything, though. "Lough Derg is extremely beautiful," says Gerrard. "It's like a hidden secret. "My farm is a little like The Shire in The Lord of the Rings. It gives shelter and food to all its animals and bees." Welcome to your Brookfield Farm + Spring Hiveshare newsletter. We have lots of exciting news this newsletter - starting with this new very pretty short film on Brookfield Farm landscape and produce. Film by ben.ie, lovely photos by nathalie.ie. First commissioned by Image Interiors and Living Magazine. AND Hivesharers ..... save the date! Hiveshare 2017 Honey Celebration Day is - Sunday August 2oth midday to 4pm. We can't wait to welcome you to Brookfield Farm for a wonderful day out for you and children. Look out for the booking link and more Honey Celebration details in our next newsletter. Lots more fun bee facts and great farm photos on facebook - like our page to get them! Did you know that we make beeswax candles by hand the traditional way. But how is it done? Rain, a wonderful farm volunteer made this fun video to show the long, slow process of hand dipping our beautiful dinner candles but it's speeded up for viewing! 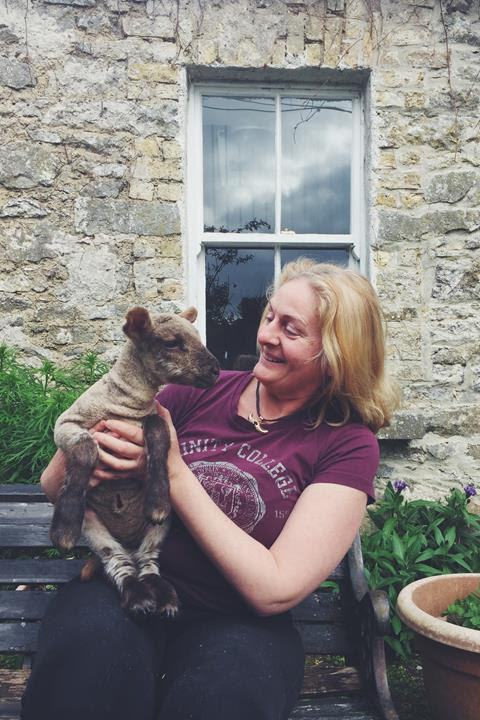 Look at this gorgeous lamb, a really jolly one... we all love her. Only 8 days old and already she rules the roost! The bees are gearing up after the winter and and are happily collecting nectar and pollen from spring blossoms right now. Did you know that pollen is the protein for baby bees? The forager bees bring bright coloured pollen in special 'baskets' on their legs. We check each hive now the weather is warmer, to see how each colony got through the winter, as the cold and wet March was hard on the bees. We also look to see how much honey store is left, and how the brood is developing. Most colonies are doing very well and producing lots of baby bees. Ailbhe is researching farms selling direct to consumers and selling harvests in advance. Right now she is undertaking travel to the UK and other countries to research individual casestudies. These will be written up for the Nuffield knowledge bank as a report. We were really pleased with our wildflower meadows sown on the farm last year. They were alive with butterflies, bees and insect eating birds last summer. We are preparing to sow around 11 acres of wildflowers again next month. They should be in full bloom for the Honey Celebration Day! A gorgeous sight. 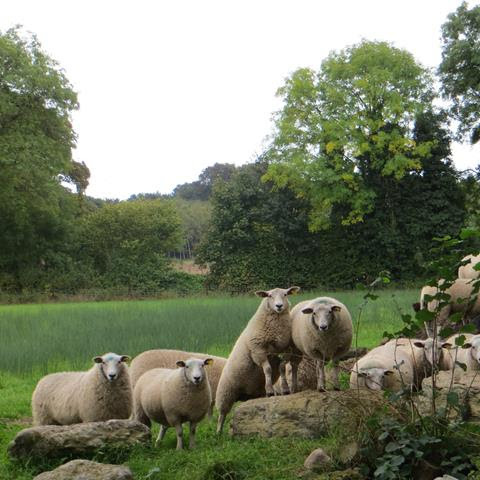 Order now.. only €20 to reserve your tasty and healthy grassfed lamb from our meadows. We have lambs up to weight, which can be delivered freezer-ready to your door. Delicious, convenient and nutritious meals this spring and summer. Normally we run a competition to celebrate Easter etc. But this time we are the winners! The Design Council of Irelandhave selected Brookfield Farm Hivegifts for a stall in their special area at Ireland's biggest garden festival Bloom. We are delighted! Thank you to DCCOI, we'll be running show specials to celebrate. We love making our natural candles - pure beeswax hand poured and hand dipped candles. Have a look at our range - Easter candle anyone? Do let us know how you are enjoying Hiveshare and our newsletters. We'd be delighted to hear your comments - email or phone and we're thrilled to chat. And do have a look at the gorgeous landscape of Brookfield Farm where we make your delicious Hivegifts! Welcome to your Autumn Hiveshare newsletter. 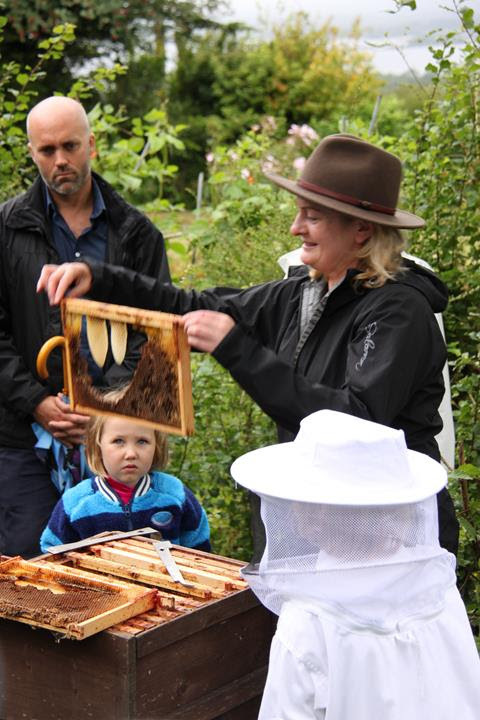 We enjoyed all the Hivesharers visiting Brookfield Farm for the 2016 Honey Celebration on Sunday August 21st. Happy Hivesharers collected their honey boxes full of Brookfield Farm delicious honey and had a lovely rural day, although it was a little damp in the afternoon. A Hivesharer sent on beautiful photos of the day - thank you David! We are adding interesting bee information and great farm photos and videos on facebook - like our page to get them! Brookfield Farm in the news! The journalists recognised that we make beeswax candles by hand the traditional way. Great to have our beautiful dinner candles appreciated by US style leaders. Lots of Hivesharers wrote asking could they meet us and collect the honey. So we are arranging a couple of collection points in Dublin in the next couple of weeks. 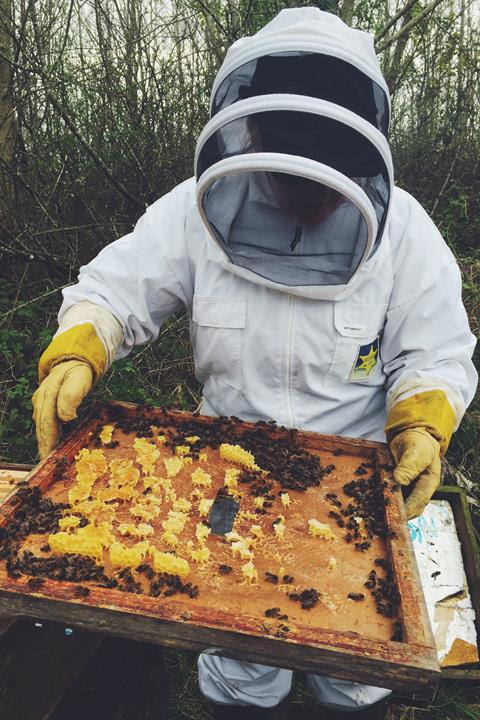 Let us know if you would like to meet and collect your honey - email us honey@brookfield.farm to arrange a suitable collection time and place. Really looking forward to meeting you! We have now harvested Brookfield Farm honey, like many Irish beekeepers honey was scarce, but we have enough between our harvest and our mentor beekeepers to meet our Hiveshare commitments. Brookfield Farm is now packing honey boxes for Hivesharers. Let us know if you would like to swop a honey jar for one of our lovely beeswax candles. There are a few different types of honey, depending on the flowers the bees visited - examples are blackberry and clover, with a contribution from tree blossoms and whitethorn, and some heather and ivy blends. We are allocating a couple of different honey types to the Hivesharer allocations, so you can taste the natural differences. This agricultural research is at personal research stage. Ailbhe is looking at farms selling direct to consumers and selling harvests in advance (sounds familiar?). Right now Ailbhe is writing monthly reports and undertaking more travel to research individual casestudies. Ailbhe is also teaching in Gurteen Agricultural College. What a huge event! Brookfield Farm were delighted to be awarded a stall in Enterprise Ireland's Innovation Arena at the Ploughing. Held in Tullamore this year, it was a great success. Three Ministers dropped by our stall to say hi - we were delighted! And an interview on the Nicky Byrne show on RTE with Nicky and Jenny was great fun. They asked about beekeeping, Hiveshare and hivegifts. 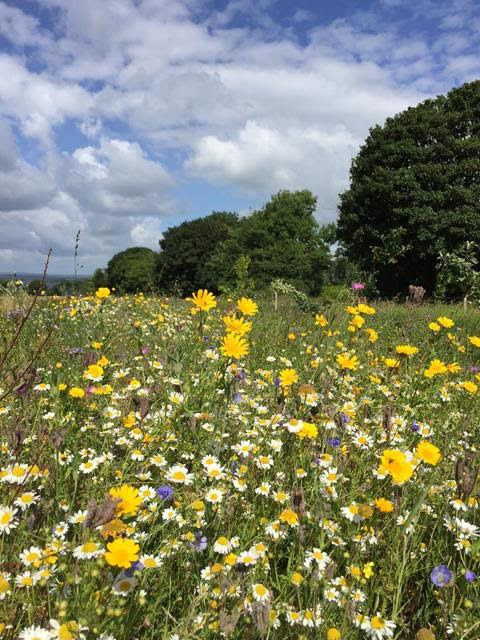 We were really pleased with our 11 acres of wildflowers sown on the farm this year. We are planning to sow again next spring. 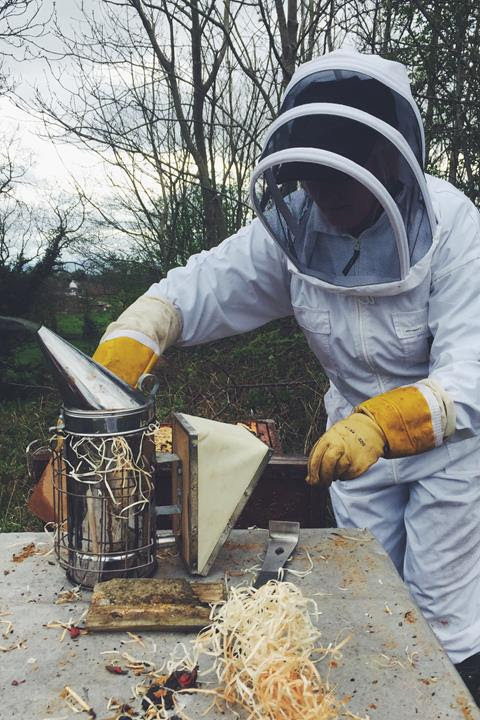 Brookfield Farm apiaries are working with our excellent mentor beekeepers to ensure your share of pure raw Irish honey from local hives. We have just treated our hives, as most Irish beekeepers do this time of the year for the varroa mite - there are lots of opinions about best treatment. The bees are settled after the summer and are happily collecting nectar and pollen from ivy blossoms right now - a very important source for winter stores. We have our new flock - store organic lambs. Order now.. only €20 to reserve your tasty and healthy lamb delivered to your door for delicious tasty dinners this autumn and winter. Mary from Westmeath has won a pair of our classic 10 hour dinner candles and a beautiful spalted beech candle holder specially made by our collaborators Elements of Action. Raffle at the Ploughing - we are delighted Mary. Your prize is on its way to you. We love making our natural candles - pure beeswax hand poured and hand dipped candles. Have a look at ourrange - they make super gifts! Do let us know how you are enjoying Hiveshare. And we'd be delighted to hear your comments - email or phone and we're thrilled to chat. Hello, we are delighted to bring you our August newsletter - have a look at the farm, bees, what we are up to! Welcome to your August Hiveshare newsletter. We have more news this issue. Hiveshare 2016 Honey Celebration is nearly with us -Sunday August 21st. We can't wait! Brookfield Farm on the telly! We were really excited to have IrishTV camera crew visit the farm as part of A Taste Of Lough Derg food series. The summer didn't fulfil its early promise, did it? In Tipperary and the rest of Ireland the summer was dull and wet. This is no good for flowers and nectar flow, and beekeepers we've chatted to say honey is scarce this year. But that is the way of nature, we just have to adjust and hope next year will be better. Luckily our mentor beekeepers who work with us have some spare honey, so we won't be too short, our priority is honey for Hivesharers. We haven't harvested honey yet on Brookfield Farm, but we will be getting to that lovely golden sticky treasure in coming weeks. Your Hiveshare honey we plan to get to you by late autumn - we'll be in touch about delivery and collection. Ailbhe is back from her agricultural research trip in June and July. It was intense and interesting travelling with 10 Nuffield Scholars to visit farms and agri-people in Singapore, Indonesia, Japan, Israel, Netherlands and USA. It's lovely to be home! Now to write up reports and more research. Delighted to be awarded a stall in Enterprise Ireland's Innovation Arena at the Ploughing! And in for a People's Choice innovation award for helping bees and Hiveshare too - would really appreciate your vote. Do drop by our stand at Tullamore during the NPA Ploughing 19-22 September! Goodness, they were colourful! We have about 11 acres of wildflowers sown on the farm this year to help the bees. All insects liked the flowers - Cornflowers, daisies, phacelia, linseed and lots more. There is still a nice blue and yellow show up on the hill, but the lower field flowers have seeded, so fewer flowerheads are showing. These wildflower meadows will stand all winter, giving shelter to wildlife and seeds to feed the birds. Still checking hives regularly to see swarming signs and if the queen is in the hive and laying. In conversion to organic! We are getting our new store lambs shortly. Order now.. reserve your tasty and healthy lamb for autumn and winter. 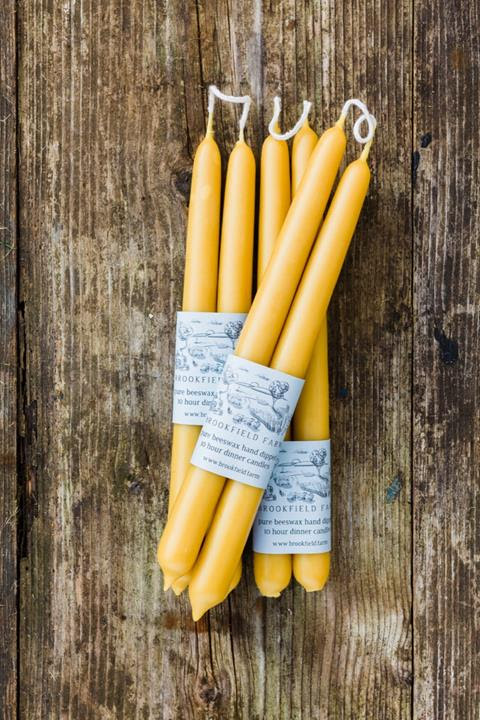 We make our lovely beeswax candles by hand the traditional way. Melted pure hot beeswax builds up slowly in layers to make our beautiful dinner candles. You might like to know about the hives in winter. The bees in this low season are very different from their summer buzz, they are quietly waiting in their frames for the spring to return. We picked a bright, warm winter day to peek at a few hives to see how they were getting on, and to show you what's happening. January was too cold, so we waited til February! 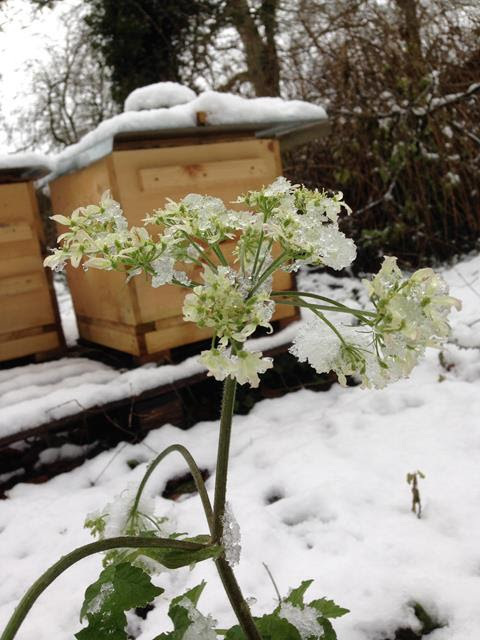 Each year we prepare our colonies for winter, a difficult time of the year for bees. Bees are cold-blooded, so cluster to stay warm. They generate heat by flexing their wing muscles and take turns being on the outside of the ball. The queen is in the middle of the cluster, protected by worker bees surrounding her. She will not leave this cluster for several months. During the winter the bee cluster will slowly move around the hiveand consume their stores. If the bees become disconnected from their food stores they may starve. Bees are very good housekeepers and like to keep their hive clean. On warmer winter days when the temperature rises above 14C they will quickly fly out to get water and begin to clean the hive. We've seen pollen carried in by the buzzy ladies! We can't wait for spring! Pop over to our Facebook page for bee photos, seasonal farm updates and interesting news. Like our page to get these updates. We love to hear from you! We are planning the Honey Celebration for August - what date suits you best? Let us know! 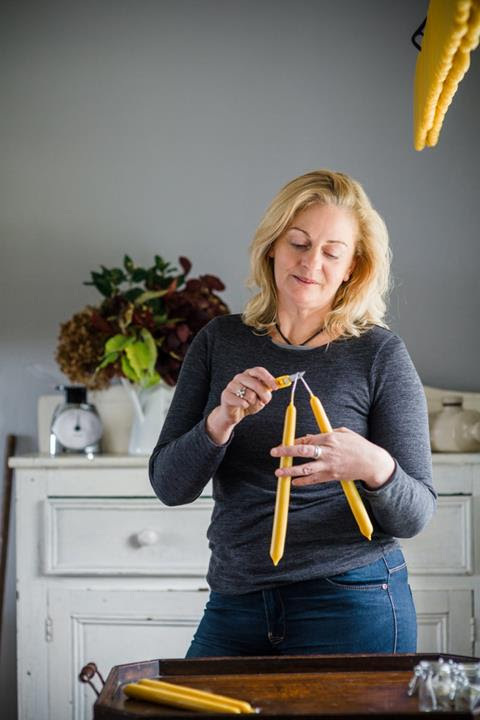 We hand make delicious pure natural beeswax candles on Brookfield Farm too! Available on our website. Ailbhe is also teaching farm business planning in Gurteen Agricultural College - a new term and enjoying meeting new students! As part of GLAS environmental scheme, we will sow 3 hectares (around 8 acres) of farmland to wildflower meadows and wild bird cover in the spring. Good for biodiversity, beautiful flowers and great for our bees! Not only bees- Lamb too! Our lamb enterprise is now in organic conversion! 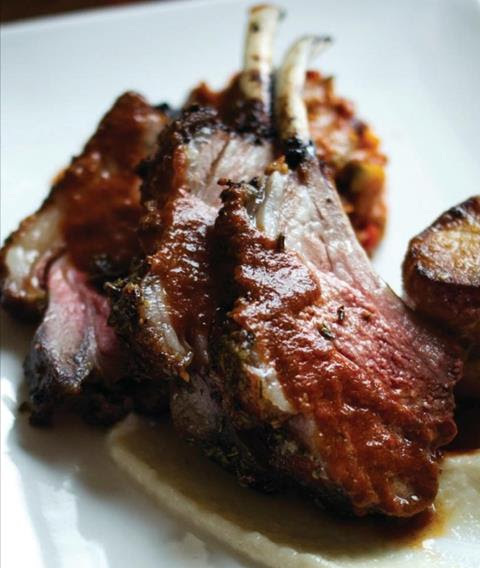 We have delicious Brookfield Farm lambs, you can book ahalf or a whole lamb. We regularly have lambs ready to go, delivered to your door. That's winter's dinners sorted!